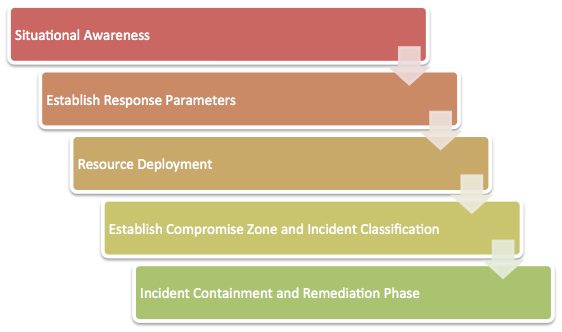 Based upon our extensive industry experience and hands on knowledge gained through the response to security incidents and the delivery of security testing, we have developed a unique Event Driven Approach to incident response that combines incident response with attack led knowledge. The ability of organised criminal gangs and motivated attackers to target organisations via the Internet has increased to a level where they are capable of executing attacks that result in huge financial gain for them, while causing both financial loss and reputational damage for the targeted organisation. Even non-targeted attacks can have catastrophic consequences and result in down time and financial loss. Having a robust approach to incident response that is both flexible and proportional is now a key requirement for any organisation doing business online. At 7 Elements we have managed security incidents for our clients that cover a broad spectrum of threats, from highly capable advanced persistent threats through to opportunistic and untargeted attacks using commonly available exploit code. Through our incident response service we are able to translate our technical insight into clear business focused advice, hands on activity and wider incident guidance. All incidents are unique and as a result 7 Elements believes that a flexible approach is required to ensure that a response to an incident is proportional and fit for purpose. Each incident will vary in terms of the technical capability, size of response and the forensic rigour required to deal with it effectively. 7 Elements tailors its service to ensure that each response to an incident is appropriate to the incident and your organisation. 7 Elements uses an Event Driven Approach to incident management that clearly defines key activities and associated resource through 5 key stages. Using an Event Driven Approach ensures that each incident is managed on its merit and enables 7 Elements to deliver a flexible and proportional response rather than a one size fits all approach. 7 Elements’ flexible approach enables your organisation to make use of 7 Elements’ expertise and resource at any or all of these levels.